It's very uncommon for me to post a recipe but I couldn't resist doing something different and posting this. 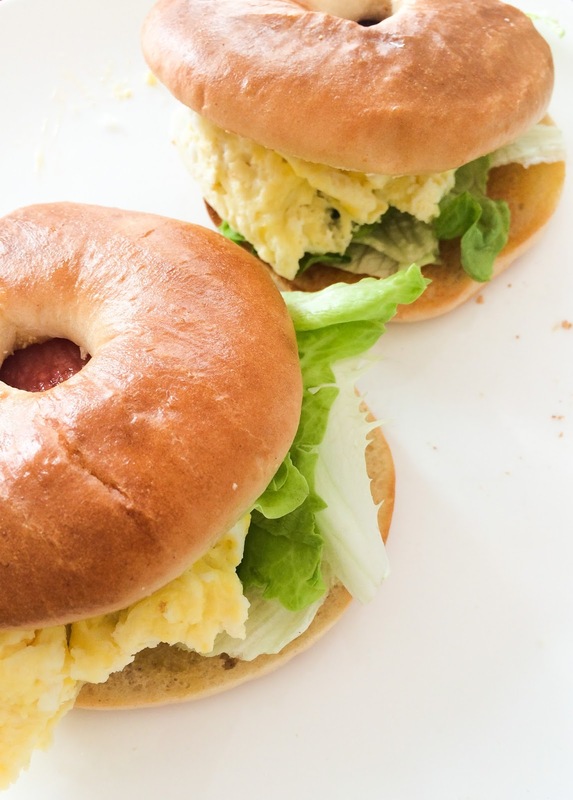 We all know bacon and egg bagels aren't anything extra ordinary but they have become a staple since (attempting) to eat healthier, I've swapped fried eggs for scrambled and have gone for low fat bacon, no cheese and a bit of lettuce and voilà! Two of these bagels come to under 500 calories and still taste scrummy. New York City Bagel Thins - 120 kcal per bagel. Sainsbury's Be Good To Yourself Smoked Bacon - 65 kcal per two rashers. Scrambled Eggs (2 Eggs and a dash of skimmed milk) - Approx 160 kcal. The first step is to cook your bacon, the best and healthiest way to cook bacon is to grill it. Just pop it on a foil lined tray on a medium-high heat and turn it half way through. Whilst the bacon is cooking it's time to scramble your eggs. It's personal preference to how you scramble your eggs. I do mine in the microwave as it's quick and easy but the key is to avoid scrambling them too much as they won't be staying in your bagel. Toasting your bagels is the next step. I like to only toast mine slightly so they stay soft but of course it's down to your personal choice, just don't pop them in the toaster too early or they will be cold by the time you fill them. Now it's time to add a bit of lettuce, you could also add other fillings but avoid adding things like cheese if you are aiming for a healthier choice. It's difficult to get the timing right in regards to the bacon and egg, one will always be done way before the other but one it's all in the bagel it doesn't matter. Always layer the fillings so the egg is in the middle, this avoids it coming out of the holes and then enjoy! Are you a bagel lover?